1960s Poster - Fleetwood Mac Gig at Queen Mary College, University Of London. Last edited by KILLAMARSHROY : 11-29-2011 at 05:39 AM. Just did a little research. It was in 1970 that november 27 happened to be on a friday. Interestingly, that was also the date that George Harrison released his 3 album set "All Things Must Pass". I was a week old. So..... Did you see them there? There is another 'Programme' that has been posted on to the Shape Of The Rain Facebook Page about The Buxton Progressive Blues Rock Festival, Buxton, Derbyshire, England. It also features Fleetwood Mac, Shape Of The Rain and many other British Bands of the time, such as 'Family'. It took place in 1969. Here's more info on Buxton (sept. 26, 1969), no mentioning of Shape Of The Rain (???). Shape Of The Rain was in the Playhouse Theatre whereas Fleetwood Mac was in the Main Hall. The Marquee Club, London - Probably the most famous Music Club in Europe. The list of Artists who performed there is Amazing and this Site makes fascinating reading. Cream, Pink Floyd, The Who, Animals, David Bowie etc. Peter Green's Fleetwood Mac performed on September 5th 1967 and Fleetwood Mac on August 30th & 31st August 1971. There may be more appearances, I have not checked. Shape Of The Rain appeared on November 17th 1971. Last edited by KILLAMARSHROY : 11-30-2011 at 09:50 AM. Fleetwood Mac Support - Shape Of The Rain, What They Are Doing Now? A 2012 New Recording and Promotional Video Clip 'Sample' by Shape Of The Rain, of 'Wasting My Time', is now to be found on You Tube. The Full Version will be available to download soon on iTunes, Amazon, & Spotify .... 2012. I was at the gig at Queen Mary College- I think ,but I remember nothing of it ,except that we were watching it from a balcony (perhaps someone could confirm or not whether the hall at this college had a balcony ,as his might confirm that it was there ) I assume that I don't remember anything due to the fact that it was a pretty unmemorable performance I'm afraid, sorry lads and Christine !Certainly don't remember the support band ! I also saw them at the Marquee club in 1971( also mentioned in this thread) -much better than the former gig I was impressed with Bob Welch's playing, and he was a pretty confident front man , but my specific memories are only that at one point, during the middle of a number, Mick began litterally drooling, and McVie , I presume at the end of the song ,went over and put an arm round him and comforted him, .I've no idea what was going on here .thoughMick's drumming throughout the the number was fine !I was a little shocked .Only other thing I can remember is ,that despite them ceasing to use Orange equipment for the whole band ,a long time previously , Mc Vie was using some huge Orange cabinet ( far bigger than a single 4 X12 )driven by some other make of bass amp,and the whole ampset up seemed a complete motley mixture Oh ,and no seating in the Marquee ,so it was a standing audience -at least in the body of the room . Can you remember what amp and cabinet Danny Kirwan used? "Mc Vie was using some huge Orange cabinet ( far bigger than a single 4 X12 )driven by some other make of bass amp,and the whole ampset up seemed a complete motley mixture"
However I woud deduce it was a Fender ,probably a twin reverb as I would have noticed if he was still using an Orange Amp as Mc Vie's Orange cab wouldn't have stuck out like a sore thumb !And I think it would have registered if it had been something out of the ordinary -ie other than Fender or Orange . Were you among the concert-goers who saw top acts like Rod Stewart and the Faces, Mungo Jerry, Nazareth and Wizard at Peak District festival? A QUICK glance at these photos and most people would be able to date them to the early 1970s, based on the fashions and hairstyles on show. But we wonder just how many readers would be able to say where they were taken or that they were there! 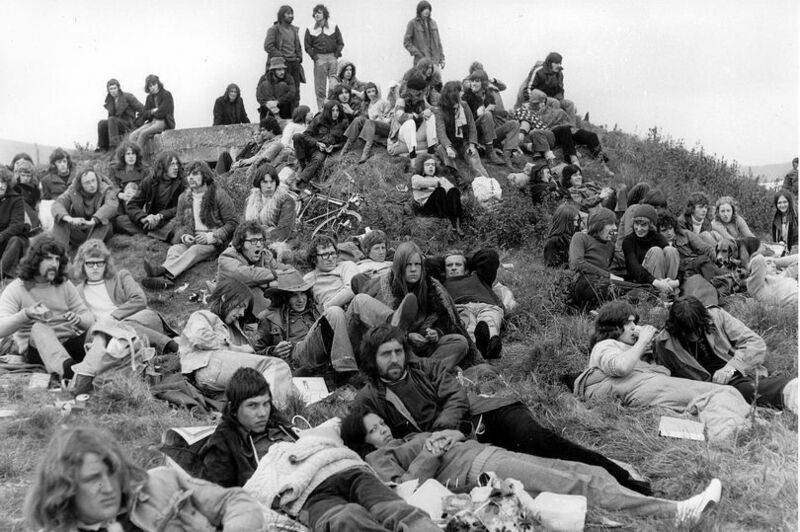 The two photos from our archive were taken 45 years ago at the Buxton Rock Festival in September 1972. Judging by the array of coats and blankets on show, the audience were certainly not enjoying the benefits of an Indian Summer, which seem to be more a fact of life in the 21st century than in the 60s and 70s when long, hot summers in June, July and August, are remembered by those of a certain age! According to a festival programme from 1974, a rock concert at Buxton was originally the brainchild of promoter Stephen Robinson. They began life in 1969 as indoor events but their popularity soon persuaded organisers to move to staging a larger outdoor festival. Anyone who lives in the Peak District will know that its weather can be rather inclement and, unfortunately, the sun did not always shine on the audiences or bands, with downpours of rain a particular problem. The first of the indoor events was billed as a progressive blues festival. It was staged at the Pavilion Gardens and boasted an impressive line-up of acts including Fleetwood Mac, East of Eden, Family and Radio One DJ John Peel. The Pavilion Gardens was the venue the following year for the “Until Tomorrow” all-night music festival in the June featuring The Strawbs, Savoy Brown, Colosseum and, once again, compered by John Peel. Two months later, another all-night blues and music festival called Sound 70 was staged, with Keef Hartley Big Band, Manfred Mann, Mungo Jerry and the Climax Blues Band, amongst others. This proved so popular that, in the November, the 2nd Sound 70 all-night progressive music festival was held, again at the Pavilion Gardens. This time, the bill included Marmalade, Ginger Baker’s Airforce, Black Widow and DJ Pete Drummond. The Sound 71 Festival was held in the summer of the following year still at its indoor venue, with Edgar Broughton, The Groundhogs, East Of Eden and Paladin providing some of the musical entertainment. 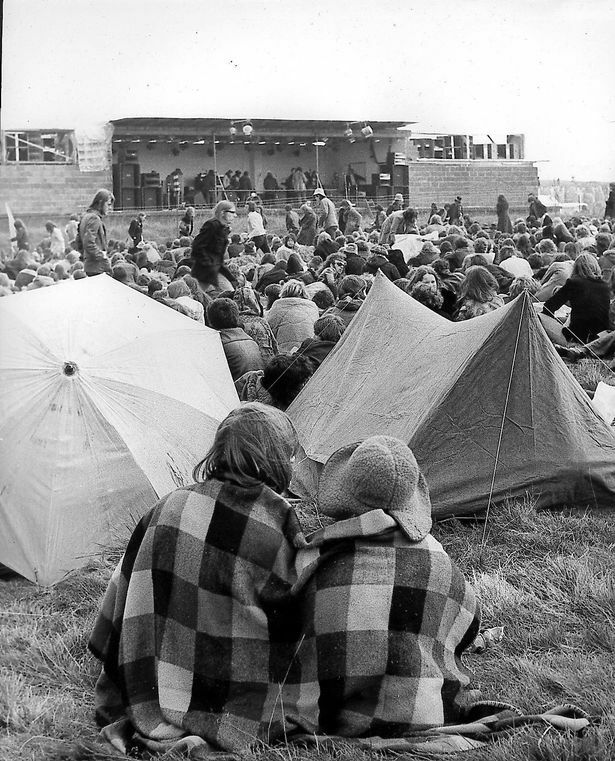 It was in September 1972 that organisers decided to brave the English weather and move to an outdoor venue, at the rather exposed Booth Farm. Billed as Buxton Pop Festival, John Peel was back as DJ but the main act on the bill, Slade, did not appear. Steppenwolf, Family, John Kay Band, Uriah Heep and Roy Wood and Wizard did perform, however. July 21, 1973, was the date for the next Buxton Pop Festival, again staged at Booth Farm. It was another good year for acts which included Chuck Berry, Nazareth, Edgar Broughton Band Groundhog and another appearance by Roy Wood and Wizard. Predictably, as with the previous year, the event was plagued by weather but that didn’t stop the organisers planning one more outdoor festival which was held the following year. Held over two days in July 1974, the first day was headlined by Mott The Hoople, with special guests Lindisfarne. The main act on the Saturday night was none other than The Faces with lead singer Rod Stewart. Humble Pie and Trapeze were also on the bill along with DJ “Whispering” Bob Harris. Did you attend any of the Buxton festivals, either indoor at the Pavilion Gardens or outdoor at Booth Farm? We would love to hear your memories and see your photographs. Contact Bygones on bygone@derbytelegraph.co.uk or 01332 411689. The 1970's really was an ugly decade I'm afraid- at least in Britain I'd say.